Fishing is one of the major outdoor sports and is the most accessible for people. Anyone can participate in it, regardless of any age or fitness ability. Interestingly, women are found equally involved in this activity as men. It can also be considered as a physical activity as they help to burn calories and strengthen the muscles. It also boosts mental health. Keeps you fit: It helps you to be fit and it ideally replaces a good work-out that we could have at the gym. It ideally gives an aerobic exercise and a total body work-out. People who try game fishing have a good chance of having a healthy heart and well-being, as this makes people happier. Improves Concentration: It helps in improving one’s ability to concentrate. While reef fishing you have to focus on fishes and this in turn will improve your ability to concentrate. Spending quality time in nature can lead to drastic changes in the brain which improves the levels of concentration. Social Benefits: This is usually beneficial for people who would like to socialize or be a part of the community. This is also a platform for other like-minded people to get to know each other and mingle. It also helps in mentoring others, educating the importance of being connected with the environment. 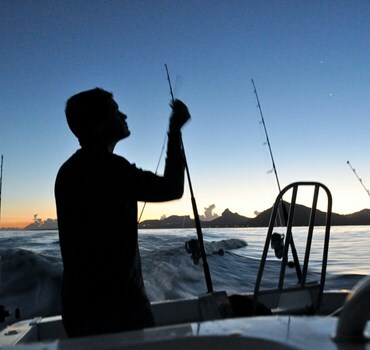 Reduce Stress: Many people believe that fishing helps to relieve stress and it creates lot of excitement. This is because people focus on a single activity and it helps the brain to perform faster and stay afresh. It is good for the eye, as we have to observe the surrounding to be an active participant in the open water. Unplug Oneself: It helps to be have a proper mental benefit, as it helps to unwind oneself from the fast forward world. This is another way of charging our self via the Mother Nature. It helps in mastering our skills which indirectly helps in moving forward to achieve personal goals and responsibility development. Health Benefits: It helps in controlling excessive fats, as it involves working and aligning each and every part of the body. It is more physical and it easily connects with the natural environment, thereby, giving more focus on the individual to explore, which indirectly works on a proper regime to reach the destination.